There are three types of blueberries: high bush, low bush and hybrid half high. Blueberries are delicate and round with a rich indigo colour and a sweet taste. Blueberries display their blue colouring due to the concentration of anthocyanin present in the skin. The colour is an innate act of nature as blue attracts birds, birds disperse the seeds thus supporting future crop growth. The blueberry harvest in North America can start as early as May and ends in late summer. 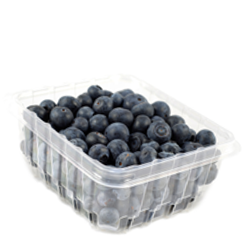 Blueberries should be stored in a sealed air-tight container and then refrigerated. Try not to wash blueberries until you are ready to eat them as the moisture will hasten decay. Blueberries can be eaten fresh, dried or cooked. They are commonly used in pies, tarts, sorbets, and jams.